Birds are a favourite indicator. 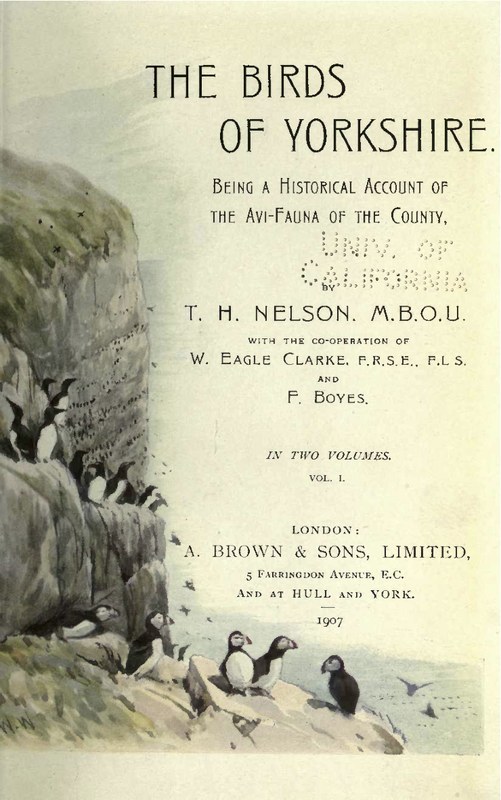 One of my favourite research texts was a PDF a kind reader sent me a couple of years ago of a century-old book The Birds of Yorkshire: A historical account of the avifauna of the county, by T.H. Nelson. It’s a wonderful book, full of just the kind of nifty oddities (albino magpies, nest-sharing doves and starlings, oddly-coloured eggs) a seer might need. Hild is a naturally suspicious child, not inclined towards belief of any sort. But she does occasionally make up reasonable-sounding stories that fit the facts as she knows them: Swallows hibernate in a vast underground cavern all winter and emerge only when it’s warm. Rainwater is some god’s tears. The north wind comes from the great black cave of Arawn. (She lives in a world of Germanic and Celtic and, later, Christian belief.) And of course she can’t know anything about death. Hild’s contemporaries find Hild uncanny–she’s unnaturally tall, unnaturally clever–and suspect her of being, variously, part hægtes (witch) or part etin (giant), and occasionally possessed by an ælf (wicked and terrible, nothing like the diminished creatures of Santa’s workshop) or wight (ghost). She is not above using these rumours to her advantage, although this choice comes back to haunt her. It’s a dangerous thing to be other in a marginal culture. But that’s a whole other blog post. Happy Halloween. oohhh, you're making me want to read Hild. any timeline on when it will be released? We human beings can be such sensing creatures. See it, hear it, smell it touch it, store it all up and use it again. Sometimes I think that intelligence is mostly from our bodies intersecting with the world. And then there's language so we can tell about it. I can hardly wait for the book either. Jude, thank you, I fixed the link. Anon, no, no timetable. You can be sure that when I know I'll post. barbara, I think all good things–all things, full stop–come from the body. Nicola, appropriate to nothing, when did you first encounter the wonderful expression “coupe de foudre”? unrelated to the above. my apologies. at the same time i realize that by reading your blog my perception gets contaminated. i'm starting seeing her with your eyes. yet i wanna be vergin. for part 2.
nor sure what to do. perhaps I'll start over and read part 1 first? That book sounds wonderful! And I'd forgotten about your previous post re: the book on elves; interesting to read that again. barbara, I don't remember. Probably while struggling with French at school. (Languages are not my forte.) But there's also a good film Coup de Foudre, about two women who fall in love. Kate, start with book one. They're designed to be read that way. I encountered coupe de foudre in reviews of books by Iris Murdock. I had to look it up, as I studied latin in high school. Coupe means literally over throw. I don't know how it became love at first sight.